Featuring Greek and Roman antiquities that once belonged to Rome’s nobility, the Palazzo Altemps offers a glimpse into the past — as well as into Rome’s Renaissance. The collection contains many marble statues in addition to frescoes, mosaics, and intricately decorated ceilings. Most famously it also houses the Ludovisi art collection. Curated by Cardinal Ludovico Ludovisi in the 17th century, it includes such classical pieces as Trono Ludovisi (Ludovisi Throne), a carved marble block with a relief of the goddess Venus. The Galata Suicida (Gaul’s Suicide) is another grouping of masterful statues that is a highlight for many. Aside from the Roman pieces there is also a fine Egyptian collection on display featuring many Eastern antiquities. The building itself features a large scenic courtyard and many rooms filled with classical sculpture. The 15th century palazzo is one of four buildings across the city that make up the National Roman Museum. Palazzo Altemps is located at Piazza di Sant'Apollinare 46, just around the corner from Piazza Navona in Rome. It is open daily from 9 am to 7:45 pm, but is closed on Mondays. 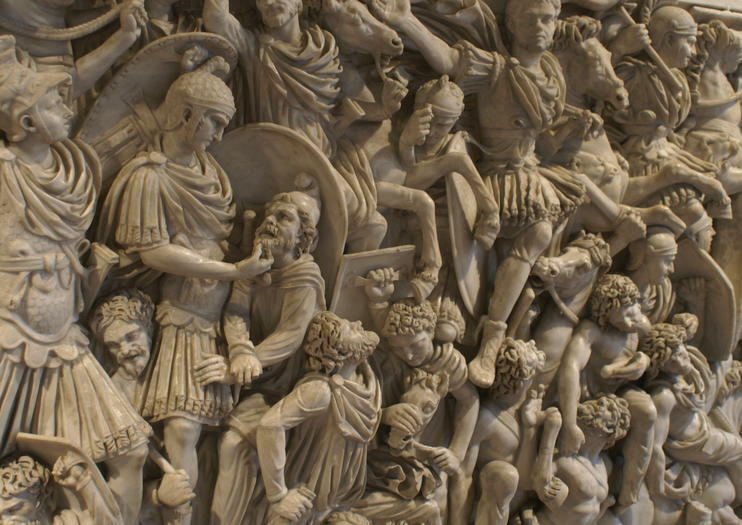 Admission cost is €7, and includes entry to nearby Palazzo Massimo and Crypta Balbi. Discover some of the classical art highlights of Rome on a private walking tour. Accompanied by your own art-historian guide, admire the Piazza Navona and view the classical sculptures displayed at the Palazzo Altemps. Visit the 1st-century Pantheon and finish at the Roman ruins at the Largo di Torre Argentina. This private tour ensures personalized attention and expert commentary tailored to your interests from your private guide. Would you like to visit Rome off the beaten path? During this private tour we will take you to one of the most underrated Roman museums, Palazzo Altemps. Wander around in a beautiful frescoed Renaissance palace, just around the corner of Piazza Navona. After your visit of this wonderful palace, you will go to Castel Sant'Angelo. Learn everything about how this castel was fortified and transformed over the centuries. Take your camera with you and go off the beaten path with us.